Big mea culpa here: I've been playing Eilen Jewell's music for years on The Santa Fe Opry for years now and I've been mispronouncing her name. I've called her "Eileen," I've called her "Ellen," I've called her "Zsa Zsa" (OK, I'm just lying there), everything but her actual name, which, (as I found out tonight listening to some of her YouTube videos) is pronounced "EEL-un." But the point is, I have been playing her songs on the radio for years, and I only play the stuff I like. 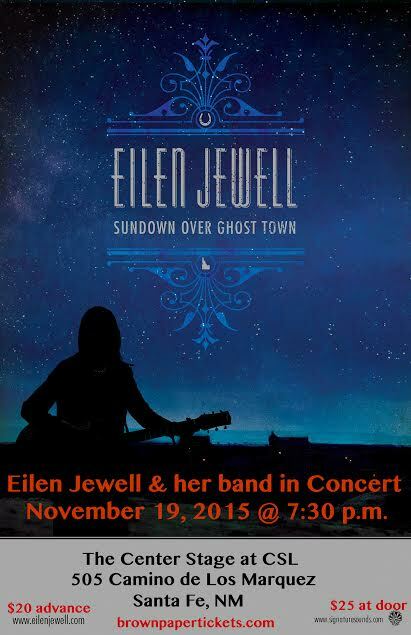 So I heartily recommend you catch her show in Santa Fe this Thursday (November 19). She'll be playing at the Center for Spiritual Living, 505 Camino de Los Marquez. Tickets are $20 in advance, $25 at the door. Buy tickets HERE. This is a homecoming of sorts for Eilen. She attended St. John's College around the turn of the century and she's said many times in interviews that her first public gigs were busking at the Farmer's Market here.